No, no, no. Not plagiarism - but as a springboard, a starting point, a puzzle frame, a make-your-own-sundae bar... pick your favorite metaphor. 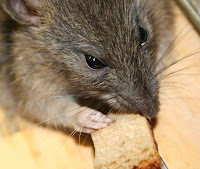 stealing a little bread? Heck, no! What desires would this new MC have? Maybe he's a banker who wishes he could skip through the park. Spend money. Go nudie in the vault. Now you have a completely different story! You can also steal style elements of a mentor text. Is it predominately dialogue? Is it in present tense? Does it have a repeating refrain? Is it rhyming? To illustrate the idea, I'm throwing a Mentor Text Challenge! Are you ready? OK! Close your eyes and walk over to your picture book shelf. Ouch! Who put that wall there? First, go to your picture book shelf. Grab a picture book, and open your eyes. Study the key style elements of this book - First person? Wordless? Circular plot? Chicken-centric? Pick one element and apply it to a current draft or on the next draft you start. Easy, peasy, don't get queasy, this challenge will be a breezy! And there's a prize! There couldn't be a challenge without a prize. So if you leave a comment sharing the book you picked and the feature you chose by November 20th, you'll be entered to win a 2013 PiBoIdMo Idea Journal (with added benefit of sending $3 to Reading is Fundamental!) 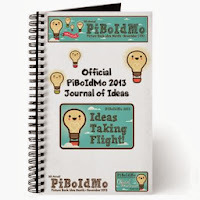 With 160 pages you can embrace the 2013 PiBo theme and let your "ideas take flight" over the next year. Let's get ready to read and kick off the Mentor Text Challenge! P.S. If you have other ideas on how to politely borrow from mentor texts, please share those too! Thanks for the idea generating exercise, Lauri! I will try it and get back to you. Do they sell those? My blog should really have a Bathroom Humor Warning sign. Maybe "The burp stops here" or "What the Fart?" or "Stay Calm and Potty On." Oops, my potty talk limit has been reached. Get thee to thy shelf to randomly grab some inspiration! The book is Angelo, a story about building restorer and his pigeon. I'm applying the "unlikely friendship" element to my next PiBoIDMo concept. Hm. I really should get more chicken-centric books. Chicken-centric is a critical sub-genre which you should really be better versed in! I had to look up Angelo on Goodreads. How about working in "MC dies at end?!" Seriously, though, it would be interesting to see how playing with that element (even if you change it in the end) could add some different angles to your WIP. My first book opens with a death. I'm deathed out! Oh that's right. I forgot Sarah Gives Thanks started like Finding Nemo! I'm still devastated by both. Just got back from the library and the book on top of the stack is Mem Fox's Yoo-hoo, Ladybug! I'll TRY the ultra short word count and repetitive structure. Nor promising anything. . .
Oh, I want to do that too. I've made myself to cut 100 words here or there, but I've never challenged myself to write a story in 100 words. That would be a good experience for me, because I like to make things really complicated for my PB characters. For my latest work in progress, I used A Storm Called Katrina to help me with voice and first person present narration. Marcie - you are the winner! Send me an email at laurimeyers (at) gmail.com! Oh Crystal, that's nacho cheese! For sneaking in and trying to steal my nachos, you have to play but you are allowed to pull from a YA novel. Dystopian? Strong female? Varying POVs? Let us know what you find and maybe I'll share my nachos. Hi Lauri. I've have to admit that I didn't close my eyes. I intentionally picked one of my recent finds...Little Red Hot. I'm applying the fractured fairy tale (impeccably done in this book) to my WIP. Also, I've read several cumulative tales lately and I'm attempting to apply that to a recent WIP that (I think) could be taken up a notch by this style. The side benefit of this is I'm finding out about great new books! I love the idea of the main character having a gift which is also a weapon. Now that you mention it, I have a MS that would much easier to execute as a cumulative text rather than the way I'm trying to wrangle it into submission now. Holy armadillo! I didn't even know you could fit that many POVs in a PB. I suppose the picture book at least provides a structure with page turns to make head hopping a little clearer for the reader. Great one, Meg - thanks for stopping by! Hi Lauri - thanks for this great idea. I chose the book (with eyes closed!) a picture book I received as a gift last year. It is Robert Frost's famous poem "Stopping by Woods on a Snow Evening" and the book and illustrations are magical. Since I also write poetry, I decided to apply this to a poem I have about winter birds that perhaps could just become ~ magical! Now that's a mentor text! Magical poetry is a great style to emulate. 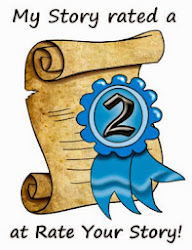 Mentor Text Resources & a Winner!